Developed well over 100 years ago, rimfires’ technology has remained unchanged over the years, and rimfire bullets are still popular even after the invention of centerfire bullets. The .22lr rifle is a fairly affordable and accurate shot, making it a favorite for many budget-minded small game hunters and target shooters. Its lightweight and minimum recoil also make this rifle a great beginner’s tool for youngsters, and overall; most people learn to shoot with a .22lr. It is a preferred option for target practice, plinking, and pest control because it is cheaper than shooting centerfire ammo. Many shooters operate under the misconception that this rifle’s versatility allows it to be paired with any scope out there. Therefore, very few of them invest in a fitting scope which in turn limits their experience with this rifle. To make the best decision, you need to understand the rimfire rifle’s capabilities and limitations. The need for a light cartridge and a thin base limits the .22lr’s accurate shooting distance to about 200 yards. Longer shooting distances are possible under the right conditions, but it’s not very effective because your bullet will drop about a foot or more at 100 yards. Since this is the case, you will find that you may not require a very high magnification optic. A powerful magnification at closer ranges causes both blurriness eye fatigue. Outlined below are our top riflescope choices for a .22lr rifle after taking all of its specs into consideration, and then we further summarize key factors to look for when trying to select the right scope for your rifle. There are several viable options of scopes to select from, varying from optics for plinkers to those for competitive championships. Prices range from as little as $30 for standard makes to over $1000 for top-notch products, and our recommendations are not biased toward popular brand-name products; instead, they are inspired by the functional highlights that count most in rimfire scopes. The simple and “no-frills” Nikon ProStaff Rimfire 3-9 x 40 is perhaps one of the best, if not the best, optics for the .22lr caliber. Although it is specifically designed for rimfire rifles, it is still widely used on all sorts of rounds. The Prostaff rimfire is equipped with a comprehensive combination of features that will greatly enhance the use of your rifle. The scope’s fully multicoated optics facilitate up to 98% light transmission to aid the shooter in dark conditions, and it is nitrogen-filled, oxygen-purged and O-ringed, so this scope is rugged enough to handle almost anything that nature may throw your way. The Prostaff Rimfire offers sufficient eye relief despite the .22lr’s lack of recoil, and its 40mm objective lens ensures a large field of view but is not hefty to the point of weighing the rifle down. This scope makes sighting easier, and the BDC reticle works superbly at distances up to 150 yards. This BDC reticle is unique not only because it is designed specifically for a .22lr rifle, but it also has see-through ballistic circles to give the shooter an additional advantage when shooting from long distances. Finally, this scope comes with a lifetime warranty. Click here to check the current price. The Nikon P-Rimfire offers quality optics and precise 1/4″ at 50-yards. Price, versatility, and material quality are favorable aspects of this scope when it is compared to many of the other rimfire scopes on the market. This rimfire scope offers a unique reticle with rapid action turrets, allowing the shooter to lock in on a target at a known distance while simultaneously having the ability to adjust for elevation with ease. The reticle is designed with multi-coated anti-glare optics to increase light transmission and reduce reflection, and the scope itself is set to be parallax-free at 50 yards. In addition, with an adjustable 2-7x magnification power, the Nikon P-Rimfire is great for shooting targets of virtually any size at a wide range of distances. 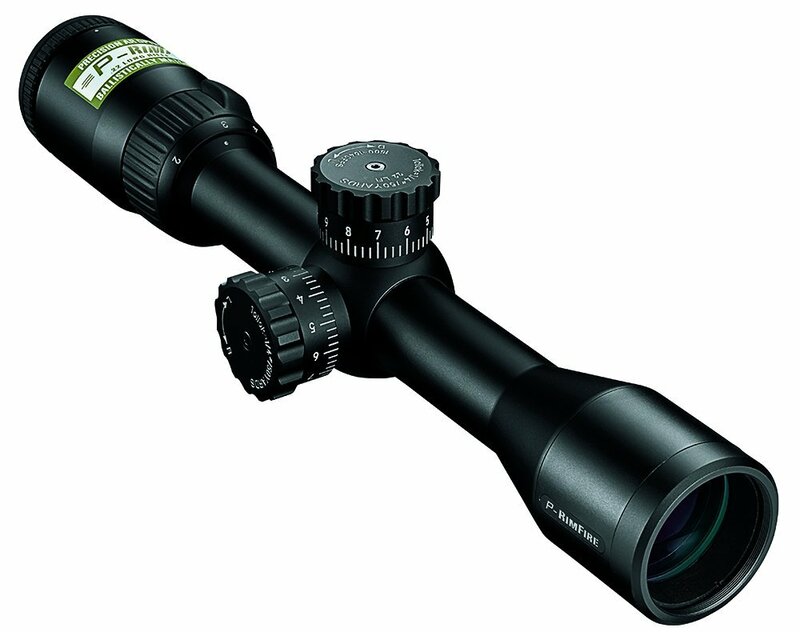 Overall, this scope comes with a solid set of features for the reasonable cost. Click here to check the current price. Simmons focuses on developing products that are dependable and extremely affordable, so their rifle scopes will only contain those features needed most by the shooter. Unlike most brands, Simmons specializes in simplicity and do not produces scopes with excess features. The Simmons .22 Mag Riflescope does not offer the clarity of the Nikon or the ruggedness of the Leupold; what it offers is an affordable alternative with all the basic features that will suit the low budget shooter. 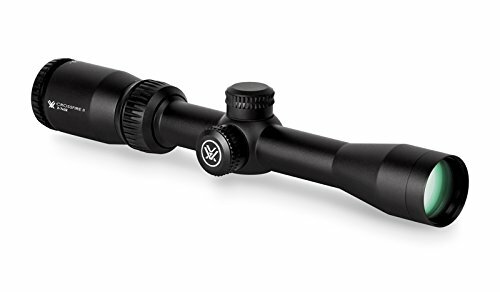 This rifle scope gives you ultimate control, featuring elevation and wind adjustment knobs that can be easily turned even while wearing gloves. It is also fitted with an adjustment knob for the objective lens to ensure that you see a clear, focused view at every magnification. With an under $50 price tag, it is one of Amazon’s best-selling and best-reviewed scopes. For that price, you acquire a scope that performs impressively at distances below 150 yards. Its 32mm objective lens offers a crisp and clear field of view under the entire magnification range. Targets may appear a bit blurry at 9x magnification power, but that should be expected of a scope at that price range. Click here to see the current price. Vortex is the company to watch in the world of optics; it is continually giving the bigger guns a run for their money with the production of better and more advanced scopes. Vortex Crossfire 2 rimfire edition is built to the same specs as its bigger centerfire sibling, but it is toned down for rimfire calibers. The Crossfire 2 rimfire is a 2 to 7 power optic with a 32 mm objective lens. The Fully multi-coated lens offers bright light transition, and a clear, high-definition picture. The parallax is set for fifty yards and is adequate for most plinking and hunting operations. The 2x magnification is excellent for close range shooting and picking your shot on a small target. The Crossfire 2 is made from aircraft grade aluminum and built from a single piece of aluminum to make the finish field-ready, waterproof, shockproof, and fog proof. This scope assures a sustainable performance and great value for the price. Click here to see current price. I know that the inclusion of this scope in this list goes against our recommendation for low magnification power scopes for the .22lr, which is included in our list of recommendations when selecting a scope at the end of this article. However, as many of you shall find out, 4x magnification is perfect for the rimfire caliber, so this scope fits in just fine. The other reason we included this scope is its price. It is an affordable scope that would be able to double as your “go to” rifle scope larger caliber hunting rifles without much damage to your wallet. This is the right scope for shooters who are after an above-average performance at a decent price range. The fixed magnification keeps the Bushnell Rimfire 4×32 light and compact; it only weighs 15 ounces. Its constant 3.3″ of eye relief protects your eyes but still offers a clear view. 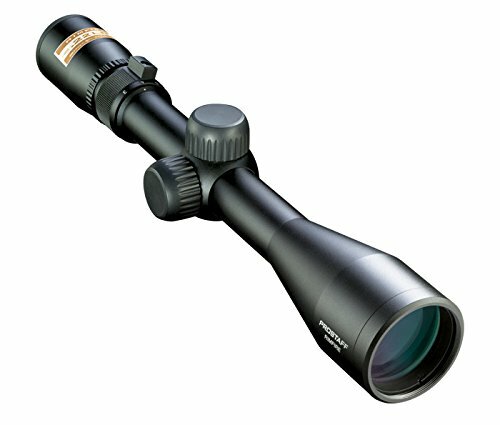 The Bushnell 4-12x40mm offers a crisp and clear picture and much better magnification than most other scopes its class. It is 100% waterproof and fog proof and offers proven durability. The manufacturer also offers an attractive warranty and world-class customer care. Click here to see the current price. 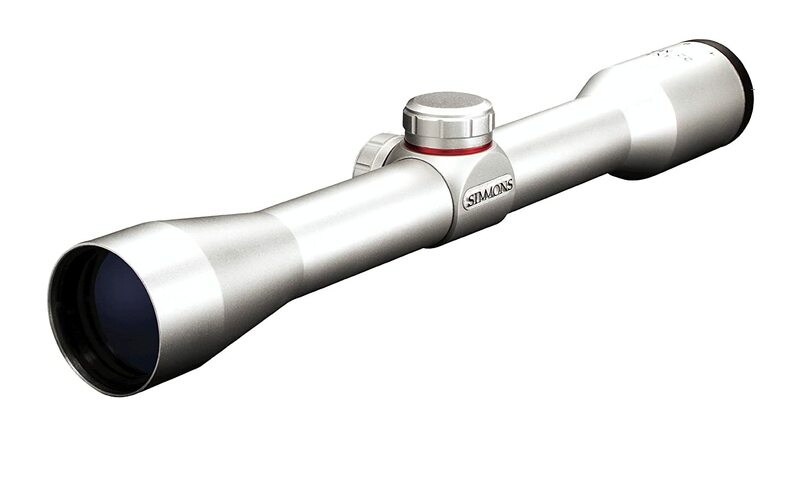 The BSA Sweet .22 Duplex Reticle Rifle Scope is a tool designed simply for reliably getting the job done. BSA has been in the scope industry for a very long time and is well known for high quality, low priced optics that can run with the big boys regarding features and quality. The Sweet 22 is no exception to that rule. Designed for the .22 long rifle cartridge, and intended to be a top quality .22 scope, the Sweet 22 features interchangeable target turrets calibrated for all popular .22 loads. The magnification and turrets are optimized for a .22 with low profile movable turrets for adjustments. Its waterproof and fog proof construction make it ideal for most weather conditions. Its large 40mm objective lens helps to maximize light gathering. This may very well be the best scope for .22 rifles for a budget-conscious shooter who wants to run a precision target scope. Click here to see the current price. Weight – light, kid-friendly, and quite handy, most .22lr rifles weigh about 5 pounds in their stock configuration. So attaching a heavy optic throws it off balance and consequentially affects its ease of handling and speed of movement. This can act against you while hunting fast-moving varmints or small game. Magnification – I cannot stress enough that a 16 power magnification scope is both impractical and wasteful on your 22lr. 3-9x or 2-7x power scopes are sufficient for rimfire rifles. Reticle – it is not relevant to acquire a scope with adjustments for elevation and windage at over 100 yards because bullet drop is typically significant at these distances. Also, note that illuminated reticles can be too bright and the resulting wash out might make small targets difficult to see. Adjustable Objective – this allows users to essentially adjust the scope’s parallax to facilitate hitting of excessively small targets. An adjustable parallax enhances accuracy at various ranges, as well as provides a clearer sight picture. Lens size – although anything below 32mm will reduce the quality of the sight picture, lenses larger than 40 or 42 mm are too bulky for your rimfire .22lr rifle. Dedication – any suitable, well-built scope can do the job but .22-dedicated scopes perform better at most times because they are correctly ranged and calibrated for the most common .22 rounds.